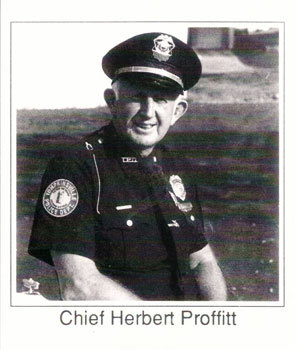 Chief of Police (Ret) Herbert Proffitt was shot and killed from ambush in the driveway of his home by a man whom he had arrested multiple times over the past 40 years. He was walking down his driveway to check his mail when the subject drove up and opened fire, killing him. The 81-year-old suspect fled the scene but was arrested several hours later. It was later determined that Chief Proffitt had first arrested the man for domestic violence in the 1970s. The conviction resulted in the man spending several years in the state penitentiary. Chief Proffitt arrested the man several more times after his release from prison. When he was arrested for Chief Proffitt's murder, he had copies of the original citations in his possession. Chief Proffitt was a U.S. Army veteran of the Korean War. He had served in law enforcement for 55 years, including as chief of the Tompkinsville Police Department and sheriff of Monroe County. He returned to work as a bailiff with the Monroe County Sheriff's Office after retiring the first time in 2000. He retired again in 2009 at the age of 79.